China's flood control authority said on Tuesday that some central and southern provinces are likely to see large floods this year as downpours swell rivers. There is a possibility of flooding along the Pearl and Huaihe rivers as well as the middle and lower reaches of the Yangtze River, said the State Flood Control and Drought Relief Headquarters website. 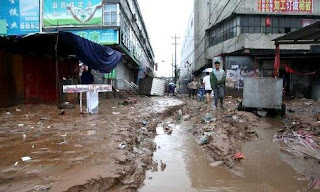 Provinces including Guangdong, Guizhou, Hubei, Hunan and Jiangxi have seen water levels in 175 rivers rise beyond their warning levels with five rivers at record-high levels. Flooding has forced more than 170,000 people to relocate in Hunan Province. In Jiangxi Province, 235,000 hectares of crops have been destroyed with direct economic losses of 4.5 billion yuan (660 million US dollars). More rainfall is forecast for southern and southwestern parts of the country in the next ten days, with precipitation in some regions likely to reach 300 millimeters within 24 hours, the National Meteorological Center said Tuesday. The flood control authority urged local officials to be on high alert against disasters and enhance inspections of reservoirs, hydro-power stations and water conservancy projects.